On March 15th Georgia Governor Nathan Deal signed House Bill 326, making alterations in the HOPE scholarship official. Previously the HOPE scholarship provided academic funding to college students who were Georgia residents that held at least a 3.0 grade point average.Public college students maintaining this minimum GPA were eligible for full HOPE coverage, which paid for tuition, remedial class and book fees.Students attending private institutions like Young Harris College received a lesser scholarship of $4,000. Next fall, college students attending public institutions are required to maintain a 3.0 GPA to keep HOPE. Their coverage will decrease to 90 percent of tuition rates, with no extra money for books or fees. This new bill also created the Zell Miller Scholarship, which is awarded to future high school valedictorians, salutatorians and students graduating with a GPA of 3.7 or higher and who earned a 1200 out of 1600 on the SAT. This scholarship will provide full HOPE coverage for students carrying a GPA of 3.3 throughout college. Full HOPE coverage won’t be available to current college students, and students will be able to lose and regain HOPE scholarhips only once. According to YHC’s Financial Aid Office, YHC students will not be as greatly affected by these changes as public school students. “Current students will have to continue to maintain their 3.0 GPA and will receive $3600 towards their tuition if they are eligible for HOPE in the 2011-12 school year,” Wanda Martin, assistant director of Financial Aid, explained. 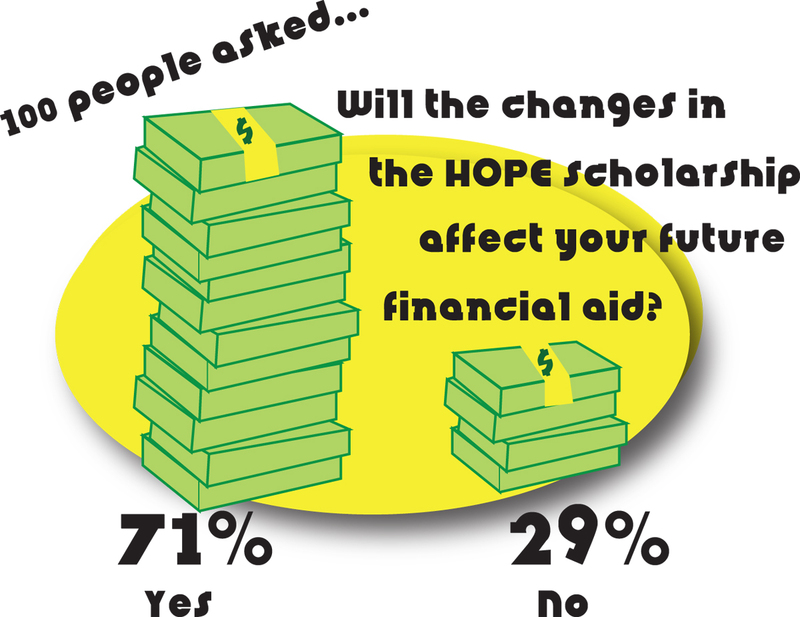 In a poll taken at YHC, students were asked if the changes to the HOPE scholarship would affect their future financial aid. Jessie Ryals, a music major from Blairsville, worries about how HOPE will affect her when transfers to Georgia State University. “Having HOPE pay for my full tuition at Georgia State will make it possible for me to go to school there and knowing that I only have one chance to lose HOPE and the decrease in coverage could hurt my college career permanently,” said Ryals. Jordan Marshall, a music major from Hiawassee, expressed anger towards HOPE changes. “Knowing that I can never get full HOPE coverage even if I made amazing grades in high school or college is ridiculous,” said Marshall. At the beginning of the 2010-11 academic school year the familiar home of our ATM was located in the bottom portion of the Myers Student Center, making it available to everyone at any point during the day. Since then, the ATM has been moved to the new Recreation Center, which has caused some form of frustration for many students. Students have questioned why their ATM has been moved from a convenient location halfway across campus. 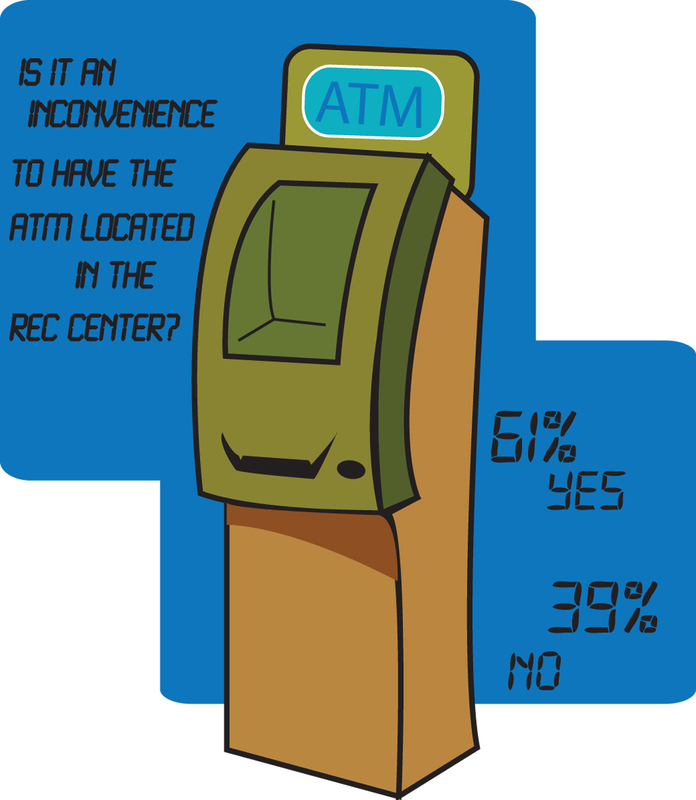 A poll was taken to find out an accurate percentage of how many students felt it was an inconvenience for the ATM to be located in the Recreation Center today. Sixty-one percent answered “yes”, while 39 percent answered “no.” Those who answered yes felt strongly that the ATM served them much better in the student center. One of the biggest issues students have encountered since the move is that the Recreation Center is not a 24-hour facility, while the Student Center was. Cody Craft, a junior history major from Elberton, also feels the hours of the Recreation building to be a major setback. 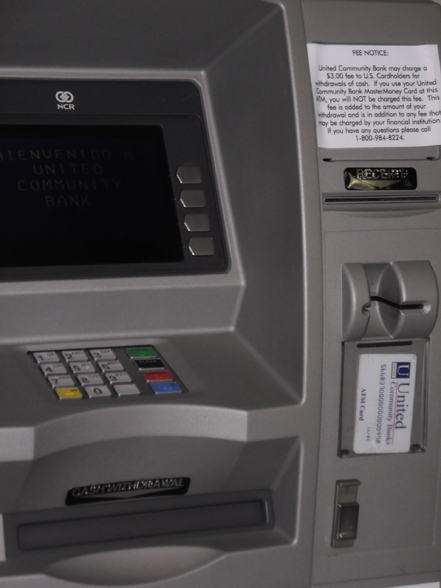 The ATM has been provided by United Community Bank, which is the main local bank in the area. When asked why they gave authorization for the move their response was that the school had requested it specifically. Shelia Parton, AVP of Electronic Banking at UCB, answered the question. Although the school made the move to better suit the lives of students, the majority still feel it would be better used in the student center. Students have also brought to attention many of the inconveniences that come with using the ATM, including the fact that there is only one on the entire campus and the service charge that comes with it. If you do not use a United Community Bank Mastermoney Card a fee of $3.00 is charged every time you make a withdrawal. This has angered many students who have accounts in other banks. “I think it is ridiculous that the ATM charges $3.00 every time you use their machine. As college students we already struggle with money enough as it is,” said Mitch Williams, a sophomore math major from Covington. Though this is frustrating to some students, the bank justifies this charge by using the fee to pay for the cost to run the ATMs. “Every machine costs between $20,000 – $50,000 dollars. It costs a lot to service the ATM and send people to maintenance it every month. The only way we can recoup the cost of the maintenance is to charge the amount of the service charge,” Parton said. Although many students felt the inconvenience, there were still those who never felt burdened by the move. Some had no idea the ATM had been moved at all. Meg Ruth Patterson, a senior biology major from Toccoa, felt that the new location was actually more convenient for her. Every year on Valentine’s Day millions of people around the world celebrate their love for their significant other by showering them with candy, jewelry and asking the familiar phrase “Will you be my Valentine?” But how many of us actually know what the term Valentine means or how this day first began? The history behind Valentine’s Day has never been officially confirmed; however, there are several stories that give us an idea of who St. Valentine was and why he has been credited with this special day. The Catholic Church recognizes three different saints, who were referred to as Valentine and were all recorded to have been martyred on February 14. One of the stories says that Valentine served as a priest in Rome during the third century, who stood against Emperor Claudius II, who made it illegal for any young men to be married. Secretly, Valentine began marrying lovers in secret until he was caught and put to death. Another story talks of the first “Valentine” greeting supposedly sent by Valentine himself. After being imprisoned it is said that Valentine fell in love with the jailor’s daughter and wrote her a letter signing it “from your Valentine.” This expression is still commonly used today. Although the truth behind the Valentine has some inconsistency, there is no doubt that Valentine was seen as a sensitive and caring figure who felt strongly about love between two individuals. Some celebrate Valentine’s Day as a reminder of the death of St. Valentine in approximately 270 A.D. Others claim that the Christian Church decided to make a Valentines feast day in the middle of February to counter the recognition of the Lupercalla festival, which was considered a pagan festival. Lupercalias was a fertility festival dedicated to the Roman god of agriculture, Faunus and Roman founders Romulus and Remus. In the 17th century Valentine’s Day gained popularity in Great Britain and by the end of the 18th century lovers began exchanging notes and tokens of affection which later turned into printable cards to replace handwritten letters. Valentine’s cards became popular in the United States around the 1700’s and in the 1840’s Esther A. Howland began the first mass production of cards in America. The Greeting Card Association has labeled Valentine’s Day the second largest card-sending day out of the entire year. It has been estimated that over 1 billion cards are sent every year and that 80 percent of purchasers are women. Even with the popularity of this holiday there are still many who have been soured to its purpose. A poll was given to 100 students at YHC which discovered that 11 percent of students considered Valentine’s Day “romantic,” 38 percent said it was “overrated” and 51 percent say it depends on the situation, such as if you had a significant other or not. It seemed an overall opinion by the student body that Valentine’s Day has become a commercialized holiday and lost much of its intended meaning. “I think that Valentine’s Day is a big hallmark holiday, and people have become very materialistic. We should show the people who are special to us that we love them every day and not just one day out of the year,” said Jill Tuttle, a senior English major from Blue Ridge. Although, for people not in the dating scene, Valentine’s Day can be a reminder that there is no one to show their appreciation for. “Valentine’s Day can be really special, but because it is geared towards couples, it can make those of us who are single feel left out,” said Jackie Hand, a political science major from Cedartown. Many of the students were not aware of how Valentine’s Day even started. Austin Freeman, who is a theater major from Hartwell recognized that people can’t appreciate the holiday without knowing the intended meaning behind the holiday. Many students agreed that Valentine’s Day should not be the sole reason that you show your love for someone. They shared that showing affection should happen throughout the year and should not be required only on one day. While there are many students who believe Valentine’s Day to be overrated, there are still those who are committed to the holiday and believe in what it stands for. Those who have a girlfriend or boyfriend often appreciate the holiday a lot more than those who aren’t in a relationship. “I think if someone has a boyfriend or girlfriend it is a romantic holiday. Valentine’s Day is pretty romantic for me because I have the best girlfriend in the entire world,” said Allen Lim, who is a sophomore athletic training major from Habersham County. New Year’s is a time for celebration, excitement and anticipation for one year to end and another to begin. Not only does New Year’s mark a time where everyone gathers around their television sets to watch the ball drop in New York City, but it also captures a time where individuals around the world begin to make their New Year’s resolutions. These resolutions can vary from flossing more, to the popular goal of losing weight. 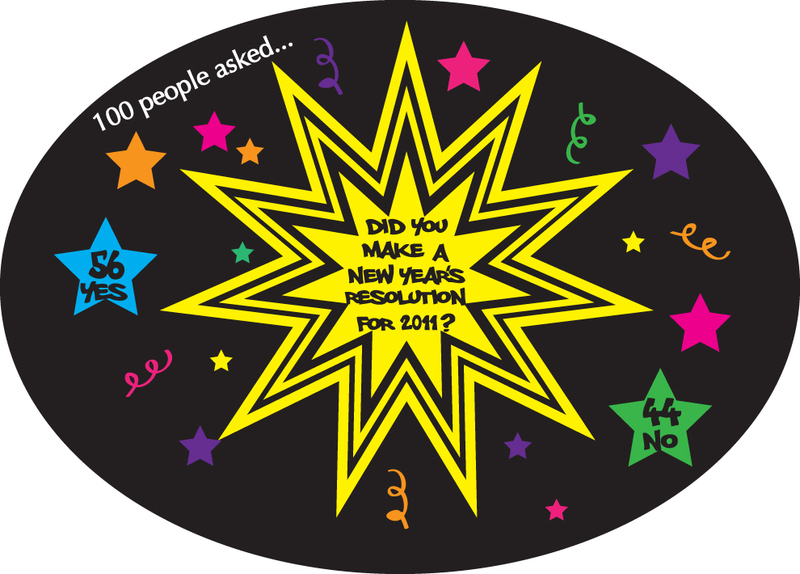 Many students from Young Harris College also have a variety of ambitions for 2011, while some prefer not to make any resolutions at all. The act of making New Year’s Resolution dates back to 2000 B.C., when Babylonians would hold celebrations during the spring and autumn equinoxes. During those times people marked the new year often by paying off debts or returning borrowed goods. The tradition was later picked up by the Romans who began offering good behavior to a double-faced deity named Janus, the god of beginnings and ends. When the Roman calendar was formed, the first month of the year was named after Janus and January 1st was established as the start of the new year. Today, individuals continue to make New Year’s resolutions as the Romans did, however, the tradition has lost much of its appeal. Many of the students who made a resolution responded with excitement and looked forward to accomplishing their goals or at least attempting too. Janelle Morris, a senior English major from Canton, shared her resolution for this year. “My New Year’s resolution is to meet a new person every single day. This is my last semester at Young Harris, and I want to take advantage of every day I have left,” Morris said. The students had a variety of goals which ranged from personal improvement to overcoming a challenging obstacle. Ky Hart, a freshman outdoor leadership major from Boulder, Colorado, made a resolution that not many people would commit too. “My goal is to kayak the Green River Narrows in Ashville before the end of the year,” said Hart, who spends much of his time outdoors. Nicole Schmidt, a freshman from Blairsville, also shared her resolution which she strives to accomplish. “My resolution is to better myself in all aspects of life, to basically become a better person and ultimately become happier with my life and myself,” Schmidt said. On the flip side of New Year’s were the students who decided that making a resolution was not for them. A study made by the University of Washington in 1997 discovered that 47 percent of the 100 million adults who make resolutions gave up on their goals after as little as two months. The University of Minnesota has continued to research the popularity of this tradition and has found that as much as 80 percent of the population does not follow through with their resolutions. Jordan Meeks, a freshman outdoor leadership major from New Zealand, shared her thoughts, which greatly coincided with study results. “I didn’t make any New Year’s resolutions because resolutions are always meant to be broken,” Meeks said. Erica Neese, a freshman from Marietta, also expressed how she believes that making a resolution does not mean that it will help you accomplish your goal. “If I haven’t done something already I just assume I am not going to do it at all. I don’t need to make a resolution if I want something to happen,” Neese said. While many continue to follow tradition and make a list of goals for the upcoming year, there will always be those students who choose not to follow any commitments and see how the year unfolds. However, the tradition continues to be a popular trend regardless of its success. Over the past year, students have watched Young Harris College bring a variety of new and improved resources to campus. While students have watched these new traditions make their mark on the school’s future, they have also received a glimpse from the past as one of the college’s oldest sports has returned to YHC. Many students have shown an ecstatic attitude towards the return of basketball, while some students seem less than thrilled. Across campus, students have shown their opinions about the sport’s return. For some, basketball is a chance to get painted up in the “Valley of Doom” – the campus nickname for the new basketball arena. Erin Royston, a freshman from Elberton, expressed her enthusiasm for the upcoming games. A lot of commotion was raised YHC prepared for both the men’s and women’s teams to play their first game, which was held last Monday. 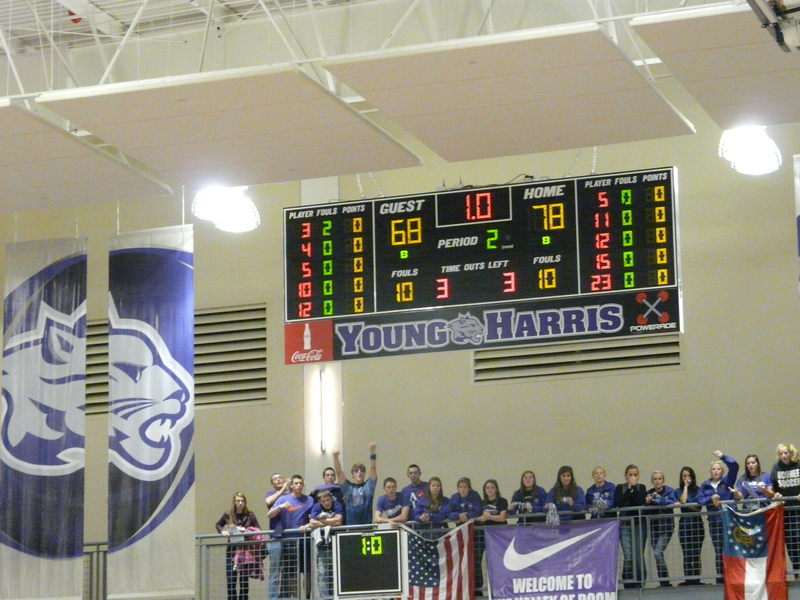 The inaugural game ended the 41 year absence of basketball from YHC. Basketball has not been an active sport since 1969. For this reason, students have been pumped about being the first to witness the sport get back in action. “It’s a whole new experience that is exciting and fun” says Shae Tyndal, an education major from Atlanta. Not only have these teams been hard at work preparing for the season, but the pep band has also been busy practicing tunes, which will become familiar cheer boosters during all of the games. “I’m really excited about being in the band with some awesome people, and I’m looking forward to seeing everyone get pumped for the first game.” said Zach Chamberlin, a freshman history major from Athens. Janelle and Jaleesa Morris have also shown their excitement for the players and the band. “I’m excited about the pep band. That’s my main thing. I’m also excited about seeing the girls play and what they can do,” said Jaleesa Morris, a senior English major from Canton. 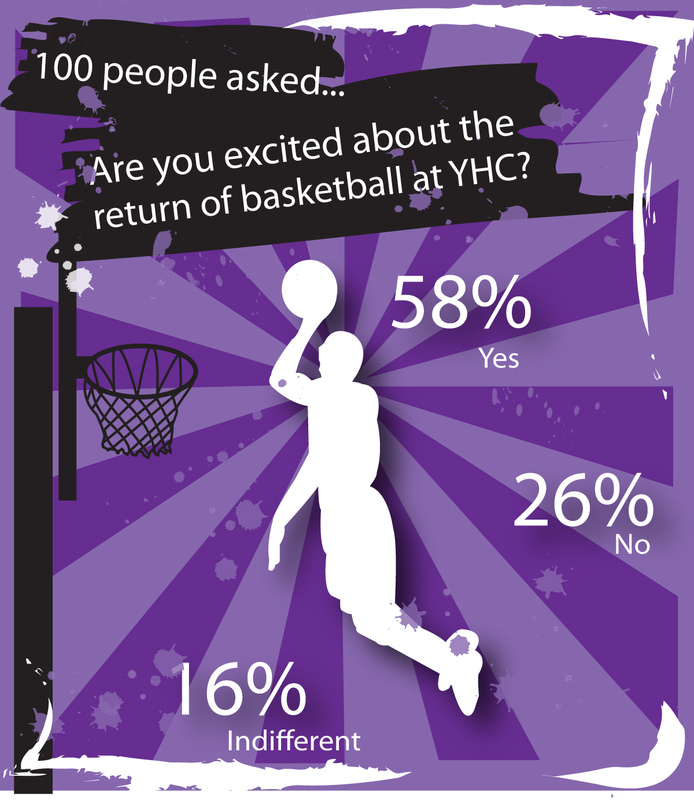 Recently, a poll asked students if they were excited about basketball’s return to YHC. While a large majority stated yes, some responded with an indifferent or even negative attitude. Of the 100 surveyed, 58 percent were excited about basketball’s return, 26 percent stated that they were not excited about basketball’s return and 16 percent seemed unsure of whether they were or weren’t excited about the sport. Rolando Fernandez, a junior music education major from Canton said he was not very interested in the returning sport. “I am not very excited about the basketball this season, because we don’t have very many legitimate players,” Fernandez said. This statement responds to the recent loss of some of the men’s team players, which has drastically cut the amount of players eligible to play. Other negative responses questioned the school’s priorities when it comes to other sports. So much focus has been placed on YHC basketball that support for other sports such as soccer or baseball seems rather weak. “Young Harris is putting too much emphasis on basketball. We have plenty of other sports that are very successful and have national championships and they don’t receive as much support. If you support one sport you should support them all,” stated a student who wished to remain anonymous. Students have expressed some frustration with all the attention that has surrounded basketball, especially when the new Recreation and Fitness Center is taken up to promote or sell the teams. Regardless of some of animosity present, the majority of YHC students and staff were excited to show their spirit. “I cannot wait to get painted up for basketball,” said Heather Richbourg, a sophomore biology major from Hayesville. Even those who don’t attend or work at the college have expressed their enthusiasm. Tron Gibbs, a resident of Blairsville and a fan of basketball, looks forward to the upcoming season. The time of year for academic advising has quickly come and gone for Young Harris College students. As spring registration finishes up, the battle to get the last available seat in a class has begun. Choosing the proper classes can be difficult for students, especially those who often find themselves at a crossroad for what their major will be and what classes they should take. To help guide students in the right direction, the Academic Advising Center places themselves at the heart of this crossroad. While every student is required to visit a staff member in the center before registration begins, some students walk away less than confident about the advice they received. This uncertainty has led students and faculty alike to question the accuracy of the Academic Advising Center, as well as the credibility of student’s statements. For upperclassman, the stressful process of class registration is quite familiar. For freshman, this new process can be a whirlwind of information and decision making. This is where the Academic Advising Center should step in. Approximately 560 students have visited the center this semester, putting this mission statement to the test. Currently, three professional academic advisors, along with approximately 32 other faculty advisors, make up the advising staff. Questions have been raised to the proper qualifications of some advisors and their ability to help students choose the right classes for their major. The bold statements made by the center have been contradicted by some students who say they have been advised to take classes they didn’t need to take. Carson Pruitt, a sophomore from Athens has run into this very problem. “I was told by advising to take two different biology courses that it turns out both could have been exempted. It felt like a huge waste of time, since I already knew the information and never needed the classes,” said Pruitt. Jordan Rudd, a sophomore from Buford has also run into problems with taking unneeded classes, which in her case never occurred because of a change in major. “I was trying to transfer out, and my advisor was trying to get me to take classes so I could graduate at YHC. Before I realized it, I was taking classes I didn’t need at all,” said Rudd. A poll was taken across campus to find out if students had ever been told by an advisor to take a class they didn’t need. Of the student body, 100 students were asked about this, and the results stated that 67 percent of the students had been told to take or had taken a class that was unnecessary. The issue of students transferring has also been an ongoing problem. 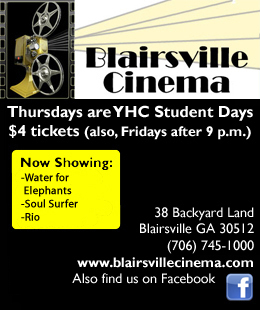 Students who are planning on transferring end up with a stack of classes that serve no purpose outside of YHC. Since YHC is a four-year institution, much of the advising focus extends to the students who wish to finish their bachelor’s degree. A concern of proper attention being given to transfer students is relevant. “It seems as though the advising center only focuses on accommodating four-year students. When it comes time for someone to transfer out, suddenly students are left on their own and don’t know what to take,” said Cassidy Jordan, a junior from Byron. Some YHC students argue that not enough attention is given to transfer students to help them take the best classes; however, Roach argues differently. Exploring class options in majors or choosing the best plan to transfer relies heavily on good student/advisor relationships. Roach maintains relationships with her students as a way of keeping up with her students’ needs. “I enjoy spending time with students and appreciate the opportunity to talk with them about their plans. I believe most students are usually open and honest with us, and we try to make the center a comfortable setting for them,” Roach said. 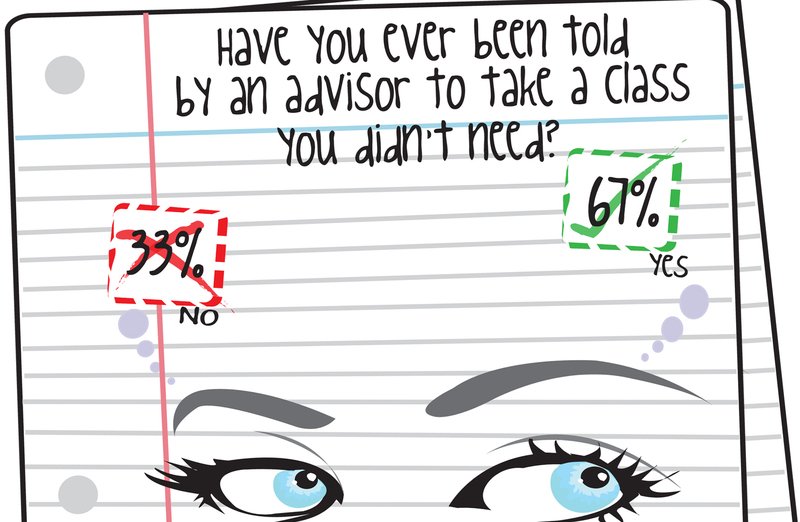 Not all students agree that every advisor has the ability to anticipate their needs, which often results in taking classes they later realize were unnecessary. However, not all YHC students have run into these problems with advising. Based on the poll, a significant number of students have steered clear of registration problems and been successful in class selection. The students within this percentage stated that they had good advisors who knew what classes their students wished to sign up for. “I have never had a problem with taking the wrong classes here. They helped me take the classes that I wanted to,” said Jessie Ryals, a sophomore from Union County. Although some students have found success with a professional or faculty advising, the majority of students still find themselves taking classes they don’t really need.The cost of classes and the issue of falling behind make choosing the right classes of high importance. With quotes from both the Academic Advising Center as well as from YHC students, it is safe to say that a lack of communication between both groups is sometimes present. “Goodnight Charlie!” If you are in the Clegg building before it closes up for the night, you will probably here both professors and students alike saying this phrase. But who is Charlie? Charlie is Charles Clegg, the president of Young Harris College from 1950-1963. He died in 1963, of a heart attack. The Clegg building was being built when Charles died, and the building was named in his honor. It is believed that Charles Clegg’s spirit currently resides in the building that was named for him. The ghost in the Clegg building is by far the most active ghost at YHC. That’s right, the most active one. There are many ghosts at YHC. 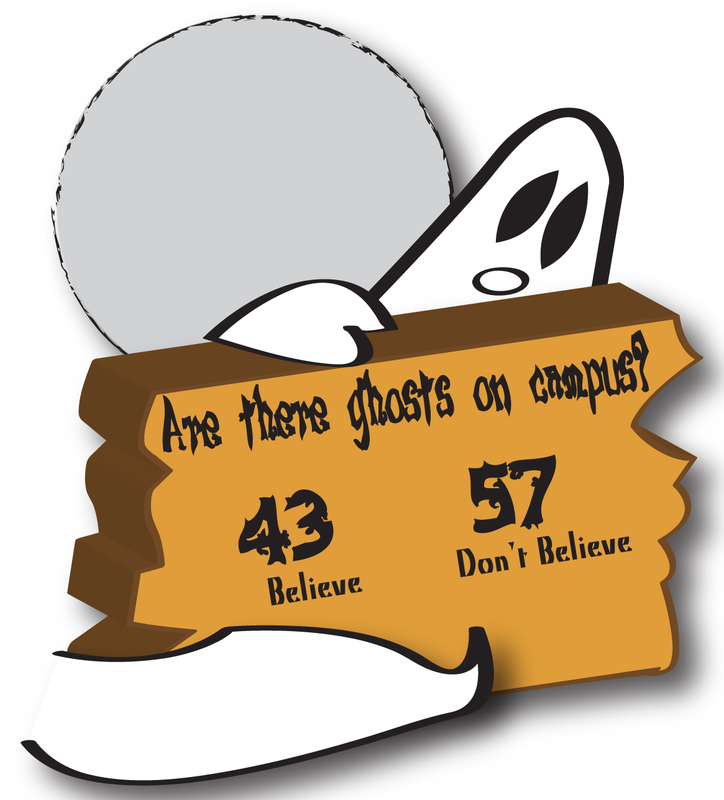 Supposedly, there are ghosts in Appleby Center, the Blackbox theatre and Enotah Hall. Charles Clegg is the most recognized ghost on campus though. Charlie has been known to play the organ that used to be in the basement of the Clegg building, walk across the stage, find lost props, break props, whisper lines to actors that are drawing a blank on stage, speak to people and even touch them. Charlie is usually a nice ghost, but he has been known to frighten people out of the building. The idea of Charlie is not something that stressed out, exhausted students have created. Dale Cochran, who has worked in the Clegg building working on sets and props for about 30 years, has had many encounters with Charlie. He says that while working in the shop in the Clegg building, he will hear someone call his name from outside. He will walk outside and there will be nobody there. He said one day while working in the shop, someone came up beside him and in a very loud voice said, “hey.” He said rather than being scared, he just calmly replied with a “hello.” He also believes he might have even seen Charlie during one occurrence. He said he was walking down the aisle when he saw someone standing in the aisle. He politely said “excuse me” and stepped around the figure. Upon looking back, he realized that there was actually nobody standing there. Charlie is not a shy ghost by any means. Many students have seen Charlie, and even though Charlie is said to be a “friendly ghost” he has scared some students so badly they refuse to enter the building at night. One student was working in the basement one night and she had a stack of CDs sitting on a stool. The CDs suddenly fell over. Thinking nothing of it, the student picked up her CDs and resumed her work. The CDs fell over a second time. The student was so frightened by this occurrence that she never entered the building alone at night ever again. Although the sightings and events could just be people’s imaginations playing tricks on them, it does give people something to think about. Charlie Clegg is not the only ghost on campus. The Black Box is also supposedly haunted by a ghost named Jesse. Jesse was a janitor in the early 1990s that loved the theatre. One night he was driving home and was killed in a car accident. His ghost has supposedly haunted the Black Box ever since. Jesse has been known to move items in the store room, make noise and walk on the catwalk. When the building is locked and there is nobody present, the motion detector lights will go off. Jesse has been seen all throughout the day, whereas Charlie is usually seen at night. One student says that she was working in the Black Box one night, when she thought she saw someone in the balcony. She did not really take any notice, until she glanced back up. She then realized that nobody was standing in the balcony at all. Enotah Hall, although being brand-new, is supposedly haunted by a ghost who hangs from the third floor at night. It is thought that this might be the ghost of Byron Herbert Reece. Byron Herbert Reece was a poet who worked at YHC. He contracted tuberculosis and after grading his student’s papers, shot himself. He died on June 3, 1958. In the later hours of the night, you can see a figure hanging from the third story. You can also see Reece sitting outside on the grass working on what is believed to be a book of poetry. Byron has been known to turn computer monitors on and off, knock on doors and shake blinds. These occurrences have been known to happen at all times of the day, not just at night. Apparently we are sharing the campus of YHC with students and faculty from the past as well as the present. Whether or not these ghosts are truly here is a matter that can be questioned. If you want to find out more about the ghosts at YHC, simply go to Google and type in “ghosts at Young Harris College,” and you will find out all you want to know. But if this is not enough, try going on a ghost hunt yourself. We’d love to know what you find.